TORONTO -- Some Tim Hortons franchisees are experiencing a delay in receiving supply deliveries from the fast food giant. The company's president Alex Macedo told the Canadian Press on Tuesday that upgrades and changes to its supply chain distribution centre were causing trouble with shipping out products. The delays are the latest irritant in the relationship between franchisees and Tim Hortons, its parent company Restaurant Brands International and subsidiary TDL Group. In recent months, the two sides have tussled over everything from cost-cutting measures to a class-action lawsuit over the company's alleged improper use of a $700 million national advertising fund. Macedo said the company recently "fell behind" on getting products out to franchisees, but the delays are "within the acceptable range" for a transition of this nature. "There's no shortage of any of the critical items," he stressed. "We expect in the next five to seven days everything is back to normal." He was equally hopeful about the company's relationship with restaurant owners, saying that Tim Hortons has a "good" rapport with the franchisee advisory board that represents all the owners. On Tuesday, Macedo said, "We have responded into Ottawa each and every year with everything we have done and we are happy to co-operate if anything comes up." 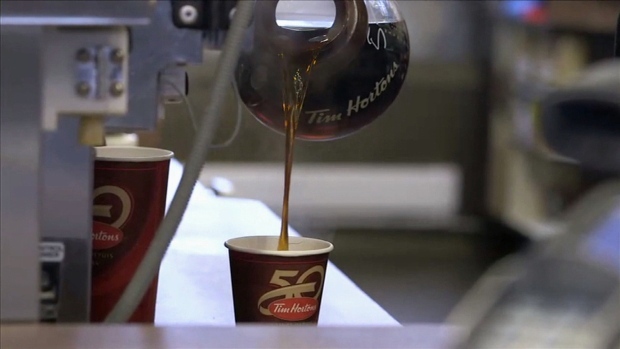 Earlier in the year, Macedo and Tim Hortons faced intense criticism after two Cobourg, Ont. franchises moved to offset Ontario's recent minimum wage hike by cutting paid breaks and forcing workers to cover a bigger share of their benefits. The move caused some customers to vow to boycott the brand. In April, they were arguing over an outspoken franchisee, previously involved in a class-action lawsuit over the company's alleged improper use of a $700 million national advertising fund. GWNFA accused the company of intimidation after it allegedly denied the franchisee a licence renewal for one of his two Tim Hortons locations. He also mentioned that the company is moving its headquarters from Oakville, Ont. to a 6000 square-metre (65,000 square-foot) space in the Exchange Tower in Toronto's financial district. "It is a bittersweet feeling in the sense that Oakville has been so good for our brand and our community for such a long time," he said. "We feel this is a big investment on our part, but we feel it is the right thing to do to get closer to our guests and to make sure we run the business well for our restaurant owners in the future."